Nyoirinji Temple (如意輪寺) is one of the popular temples in Yoshino, Nara Prefecture. It was established during 901 to 922. During the middle of 14th century, this place was settled as the temporary imperial court and this temple was the main temple of Emperor Godaigo. There is a beautiful 3 stories pagoda and the mausoleum of Emperor Godaigo. Nyoirinji Temple at Mt. Yoshino in Yamato was established during the 901 to 923 by Saint Nichizo Douken who is the brother of Dr. Miyoshi Yoshiyuki. Saint Nichizo Douken advised the Emperor Daigo to become a believer in Buddhism. When the Emperor Go-Daigo transferred the capital to Yoshino, he worshipped at the Nyorinji with Kusunoki Masatsura and his 143 retainers in 1346.. The Nyorinji was on the decline after the Seityu. 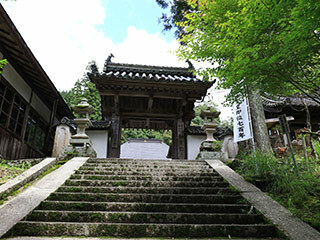 Saint Bunyo Tetsugyu rebuild the temple in 1650. He converted the Nirin-ji from Singon Buddhism to Jodo Buddhism. He protected the Emperor's Mausoleum. Emperor Godaigo defeated the arbitrary Hojo shogunate and carried out the Kenmu Restoration in 1333. But, Ashikaga Takauji resisted Emperor. The Emperor escaped from Kyoto and went to Mt. Yoshino in Nara in 1339. He transferred the capital to Yoshino and worshiped at the Nyorinji. Though the Emperor had been eager for defeating Ashikaga Takauji and coming back to Kyoto, he was taken ill and passed away in Yoshino after all. His last word was as follows "I am very sorry I can not come to Kyoto anymore. Bury me toward Kyoto at least, when I am dead. He was buried in the mountain behind. And, it was called Tounouryo. The Emperor Go-Murakami succeeded in Yoshino. In 1346, the second year of Shoguhei the large army of Ashikaga began to charge at Yoshino. Kusunoki Masatsura and his 143 retainers bided farewell to the Emperor hurriedly. After that, they visited the Mausoleum and worshipped the Nyorin-do. There they cut their hair a little and offered them to the Buddha, and wrote down their names on the necrology. Lastly, on the door of the Nyoirin-do, Masatsura wrote down a farewell poem with the arrowhead to express his desperate feeling "I think I cannot return alive this time. So I wrote down many names on the necrology and I am going. Thus he went to Shijounawate in Osaka, and fought heroically and died with his brother Masatoki. The existing Nyorin-do is rebuilt in 1650. But the door still remains in the treasury.